The dinosaurs would disagree. After owning the Earth, they were now in a bit of a bother. A major re-arrangement of the Earth had taken place. Pangea had split; Gondwana was broken up. The Indian ocean had formed but not in a clean way: a number of parallel rifts were running through Africa, and the easternmost rift had won the prize and been awarded the Indian Ocean. The other rifts did their best and did succeed in splitting off further bits of Africa. Mozambique went, but did not go far. Further north, a larger part split off and a sizable landmass begun to move away from Africa, accelerating as it did so. On its way, India crossed a hot spot in the crust (this is the hot spot currently underneath Reunion Island). It caused havoc. The hot spot melted a substantial part of India’s lower crust, causing the much-thinned sub-continent to begin to move much faster across the Indian Ocean. This finally ended with a major collision as it went at headlong speed into Asia. But before this, the melt found a way through and began to erupt on the surface. The flood basalt formed the Deccan traps, and in the process poisoned the atmosphere. The dinosaurs did not like it. And than the asteroid hit, while the Deccan trap eruption was still in progress. Left alone, the dinosaurs would have survived the volcanics, and probably have recovered. As you read this post, you would have lifted your tail and thought about how Darwin had proven that humanity had evolved from tree-dwelling reptiles. Instead, the devastation coming from the Yucatan amplified the turmoil, spread worldwide, and caused years of global winter. Not a single dinosaur survived. Sometimes, the Universe just does not play fair. We, the mammals, came out winners and we would have reason to be delighted about this unexpected course of events. But dinosaurs fascinate us, and their demise is regretted by everyone’s inner child. Both volcanoes and asteroids ended up with a bad press, presented as random killers which are best avoided. But in this post, I will try to restore their standing. Asteroids may be dangerous, but they can also save us – from a danger that is still far in the future, but which makes the current global warming look like small fry. And fry we will, if nothing is done. Our lives are shaped by the Sun. We are creatures of the day (teenagers excepted), needing light to live. We also need the warmth of the sun, as we lack a natural insulating skin cover. But it goes further than that. Our world depends on a constant climate. The crops we grow need to be in a certain range of temperature and rain fall. Even a seemingly small change can make our crops vulnerable to diseases and pests, and reduce the yields. In some places we will now need to change crops to cope with climate change. But overall, we have been lucky. Over the past 8000 years, the climate has been remarkably stable. But it has not always been like that, and going back in time there were both ice ages and hot-house ages, when the world was different and habitability was not always guaranteed. The ultimate driver of our climate is the sun. It is extremely stable: variations are only by 0.1%, too small to have a significant effect on our temperatures. There is an effect from the orbit of the Earth: the ice ages were triggered by a change in the orientation of the Earth, which affected how much sunlight falls on land rather than the oceans. A small change for the Earth – but a big change for us. But the sun itself was not to blame. But it won’t always be thus. Very, very slowly, the sun is getting brighter. This is not on human time scales. When the Earth was formed, the sun was fainter by 25% than it is now. That was 5 billion years ago. The Earth compensated for the very-slowly brightening sun by reducing the amount of greenhouse gases in the atmosphere, lowering the thermostat a little. But this will not work forever. Eventually, the minimum is reached, and temperatures will begin to increase. Trouble will start in another half a billion year, and a billion year from us, the sun will be 10% brighter than it is now, and temperatures will have become so high that complex life will become impossible. Shortly after the oceans will begin to evaporate. This is still over unimaginable time scales. But scientists are paid for long-range thinking. Lucky we have plenty of warning, and science has time to devise ways to keep the Earth cool. What can we do? Some blue-sky thinking is required. There are a few things we can consider. First, could we devise anti-greenhouse gases? Greenhouse gases let visible sunlight through, but stop the infrared radiation from the Earth from going out. Some gases act in the opposite direction: they stop visible light, but let the Earth’s radiation out. Can we add that to our atmosphere? Yes, we can, but it is unlikely to help. The main such gas is SO2, which indeed has an anti-greenhouse cooling effect. But it doesn’t last in the atmosphere, and breaks down within years. So we would need to continuously pollute the atmosphere with SO2, and as soon as funding would run out, the Earth would heat almost immediately. We can paint parts of the Earth white, to increase reflectivity. This happened during the ice ages, but it would mean keeping the Earth colder than it is now, so that snow occurs continuously at low latitudes, and does so without any break. A better way may be to cover 20% of the tropical oceans with a white material – but not ice. Less practical would be a solar shield: a fabric floating in space between us and the sun. It would need to be three thousand kilometer in diameter. And we would need to devise a way to keep it aligned. It couldn’t be in orbit around the Earth. Keeping it stable for a billion year may be an unsolvable problem. Can we move house? How about living on Mars? That is not ideal either. We would need to some drastic planetary engineering to give it an atmosphere that can keep it warm, but the planet is too small to maintain a stable atmosphere. It would need continuous re-engineering. A quick trawl through the estate agents does not reveal other vacant properties in the right location. This leaves only one option. It is the mobile home solution – we need to move the Earth. We don’t need to move by that much! To counter a 10% increase in solar brightness, we need to move outward by 3%. At the moment we are orbiting the sun at a distance of 150 million kilometer. This needs to be 155 million kilometer. A 5-million-kilometer move must be doable. There are some consequences. At the moment the year is 365 days long. That will become 380 days – we need to put two extra weeks somewhere in the year, or add a day to each month. This is just the initial move. As the sun keeps brightening, we will need to keep moving further, and as the increase gets faster, we will need to move faster. But let’s first do the first billion year move. To move to a different orbit requires changing your velocity. To move 3% further out requires making the Earth move faster. Over the billion year, we would need to accelerate by 500 m/s. For a rocket, that is not hard. But the earth is a lot heavier than a rocket. How can we do this? In fact using a rocket is not the only way you can pick up extra speed. Long-distance missions try to fly past one or more planets on the way, in order to use a gravitational assist: you let the planet bend your orbit, and in the process you end up go a little faster (going slower is also possible). It is also called a gravitational slingshot. Often, Earth itself is used. It is funny to launch a mission to a faraway place, and after 12 months see it fly past Earth within a thousand kilometer of its launch position. It is not an error in the directions – it is done to go a bit faster than the launch rocket could achieve by itself. Rockets are an incredibly inefficient way to pick up speed, because you need to accelerate the remaining fuel as well, and most of the craft is fuel. So space missions are paired back to the bone regarding their net weight. By using a gravity assist, you can get a few km/s extra velocity, and because you need less fuel, the actual spacecraft, the bit with the instruments, can be made heavier – and bigger. All large missions now use this method. But the laws of physics are pretty inflexible, and they do not allow this to go unpunished. As the spacecrafts gains momentum, the planet needs to lose it. The accountants of physics insist on balancing the books. Now the planet is a lot bigger than the spacecraft, and it only needs to change velocity by an unmeasurable amount in order to keep Newton happy.. The planet (say Earth) may be 1022 times heavier than the spacecraft, and the velocity change scales with the inverse of mass (in order words, mass times velocity is constant). So no worries – we are not doing anything bad. We are taking a few milli-pennies from the very very rich to pay off the debts of space travel. In the example above, Earth is used to speed up a spacecraft as it is traveling to the outer solar system. That means Earth slows down, and as you slow down you drift towards the inner solar system. (It also means that as you drift inwards, you pick up speed from the sun’s gravity, and in fact gain more than you lost in the first place. In space, if you slow down you end up going faster. That is rocket science.) Inward, towards the sun, is the wrong way for us. So instead of launching things to the outer solar system, we need to use fly-bys of satellites to send the spacecraft inward, to the inner solar system. They slow down and we speed up, drift outward – and end up going slower. Such is life. Ida, an example of a 60-km asteroid. It also has a small moon, which could be used as a gravity tractor. Spacecraft are much too small to make a real change to the orbit of the Earth. Even if you had one fly-by every second for the next billion year, the change would still be a factor of 10 million smaller than what we need. Now do the same thing with an asteroid. Take an asteroid of 60 km radius (that is big – there are not so many in that category). It has a mass one millionth of the Earth. Put it on a fly-by which slows down its own speed by 0.5 km/s. Do this a million times – and the Earth will increase its velocity by the amount we need. After a million fly-bys, the Earth is in its new, up-town orbit. And as we have a billion years for the move, this means we only need one fly-by from the asteroid every 1000 years. But after the first encounter, the asteroid is drifting towards the inner solar system. How do you get the asteroid to come back to us for the next encounter, for the next fly-by? Initially, no problem, as it will still be on an orbit that intersects ours – only the orbit will now be more elliptical, with closest approach to the sun closer than it used to be. But after a couple of such these gravity pushes, it is getting too close to the sun. How do we solve this problem? It is easy! As the asteroid slows down in its orbit, direct it towards Venus. Now the asteroid can do a Venus fly-by in which it picks up its missing speed again. Venus will slow down and move inward, heating up even more than it already has, but Venus is a lost cause anyway. Venus will redirect the asteroid towards us, and the process starts again. The risk analysis flags up one awkward possibility. A slight deviation from the intended course could be sufficient to instead of a fly-by, have a direct hit. And hitting the Earth would be bad. An asteroid that size will create a crater 2000 kilometer across, ten times to size of the one that exterminated the dinosaurs. Nothing would survive, and there would be no need to move the Earth any further. Now NASA is on record that there is only a chance of one-in-a-million that a gravitational assist would go wrong and the spacecraft hit the Earth instead. So, since we are planning for a million fly-bys, that makes the chance of a mishap 100%. (Actually, 50%.) That is not quite acceptable. So, you need to be able to make small course corrections to the asteroid, while it is on the way. The earlier you catch a potential problem, the smaller the correction is that is needed. So, be vigilant, and once you spot a deviation, fix it immediately. Such small course corrections can be done using a so-called gravity tractor. Put a spacecraft near the orbit of the asteroid, and give it a very small engine, enough to keep its distance to the asteroid but not enough to get away. There will be a tiny gravitation force from the rocket on the asteroid, but over time it adds up to a small change in orbit of the asteroid. And only a small course correction would be needed, so this can be sufficient. Remember, we have a lot of time. In the example of Ida above it has a miniscule moon which could be used. It is still uncomfortable to have a large asteroid flying past only a few thousand km above our heads. The margin for error is not large. Can we do better? Yes, if you are willing to make a small sacrifice. Instead of the Earth, we can fly the asteroid past the moon. We will use it to speed up the moon, which will put it into a wider orbit around the Earth. After a number of such fly-bys, the moon will eventually escape from Earth altogether and enter its own orbit around the sun. We may need to fly the asteroid very close to the moon, but this is no problem as there is no atmosphere, so you can get as close as you want. And if you do miss, you only hit the moon and a moon-wide extinction event is also a zero-impact event. The velocity of the Earth will not be affected to any significant degree by the change to the moon’s orbit. But once the moon is free, it can now be used for fly-bys. Because it is much heavier than an asteroid, you need fewer fly bys – a few hundred will do. And they can be at a much larger distance. Once you have moved the Earth to its desirable location, you leave the moon parked in an accessible orbit, for when you need to move Earth again. The Trojan point is best: this is the same orbit as the Earth, but 60 degrees behind it (or in front of it). An object in a Trojan point is in a stable orbit. This will work for almost the full 5 billion years the sun has left before it becomes a red giant. (By that time, the sun will be twice as bright as it is now.) Eventually, while we are moving the Earth we will get too close to the orbit of Mars and a collision would become likely. That could recreate our moon (the moon formed when a Mars-sized planetoid called Theia (named in hind sight) smashed into the Earth) but that would be the only redeeming feature. We would therefore have to get rid of Mars in some other way first. I am open to suggestions. The dinosaurs died out because of bad luck. The Deccan traps was a survivable event. The asteroid impact was also a survivable event, at least at some distance. But the combination was lethal. What was the chance of the asteroid hitting while the Deccan eruption was in progress? It turns out, not that small. Flood basalt events are fairly common. Since the time of the Cambrian explosion, the chance of an dinosaur-extinction-size asteroid hitting during a Deccan-sized eruption is not far from 50%. If not the dinosaurs, it would have hit someone else, but eventually it would have happened. But we are not dinosaurs. We can know what is coming, and our science can find solutions. All we need is imagination – and an accurate calculator. Physics can do the rest. Moving the Earth is not difficult. It only requires a bit of physics and a lot of time. Asteroids can save us again, as once they saved us from the dinosaurs. Only the dinosaurs would disagree. Thanks Albert! An interesting speculation. An alternative might be another well-place Krakatoa…! Your article reminds me of the film: The Day the Earth Caught Fire. Now that takes me back. Great post Albert and credible science. I need a few billion black holes aligned in a particular configuration to use as superpositioned quibits, entangled with the pre-existent universal black hole, for a gigantic quantum computer I can plug into with my laptop to generate a holographic universe more to my liking. Any ideas? Any good at billiards? Done. I put the black holes in the requested configuration. The entanglement required isolation from secondary observers. To achieve that I had to place the full configuration inside another black hole. You can find it at the centre of the Milky Way. Good luck! Let us know how you get along. Well that was easy. Thanks. I suppose if they were already entangled with each other, anywhere and any time, its a cinch for someone with your expertise to manipulate them en masse. Laptop – > Internet – > Global cybermind – > Galactic cybermind – Universal quantum supercomputer. You may not notice the tweaks I made with a few lines of Access VBA but it is now a perfect universe. Good one, Albert! Or maybe we could nudge a comet or into Venus to cool it down and move it away from the sun? This was really fun reading! Thanks! Some dinos are, however still here and some of them very clever, using tools and very inventive! Birds!! Amazing how clever some of them are with their very thiny brains..
2017 U1 actually gained speed as it zipped through the solar system. The energy donor was the sun. HAD IT HIT… the crater would have been about 3.02 km across. I think the miss distance was about 0.10 AU. Reads almost as if you are planning to become a James Bond supervillain or something. Definitely. It would make an excellent bond thriller. A bit slow in the making, perhaps. Bond movies of late have been a bit slow anyhow…. Or are they just aimed at the “bit slow” demographic? Lurker, don’t comment much, but + many. That was funny. You could say this plan could be, ahem…..
No need to run. I came up with a description of my job list tomorrow. “The Circle of Strife” because my actions are going to irritate others who will then take it out on their customers. It’s a never ending cycle. This actually helped me finally easily understand how gravitational assists work. The inflation may be rebound. A lot of magma had moved out of Bardabunga during the eruption, and this would have left the area underpressured. You can expect sideways movement to rebalance the pressure. After deflation of 60 meter, inflation of 5cm is not large. Grimsvotn indeed showed 5cm inflation between May and September. That is likely real. To get a large fire eruption (>10km3), you need a magma source. None of the big three, Bardarbunga , Katla and Grimsvotn. appear to have enough, based on the depth of their calderas. I think the risk there is remote. A smaller fire (like the one from 2015) is always possible, anywhere along the rifts. Didn’t one of Carls old posts come to the conclusion that the skaftar fires eruptions were direct mantle eruptions and not from grimsvotn directly? I know the magma has to come from somewhere but the crust in the rifting areas is probably thinner than the rest of the crust, and maybe the space is filed with magma that will erupt when the crust breaks every now and then at probably semi-regular intervals. I saw from your series on eldgja that you said they were all basically like bigger versions of holuhraun, and that the major calderas of the volcanoes there formed in these events, which seems to fit basically every other lava eruption at any other volcanic area anywhere, but such a huge difference in magnitude between a flood basalt rifting fissure eruption and the small crustal eruptions elsewhere on earth might require a more substantial source of magma. I disagree with the 60 meter deflation comparing with the 5 cm inflation Albert. The 60 meter was measured on the icesheet of Bardarbunga as a result of the emptying of a magma chamber, local, under the Bardarbunga caldera. Not exactly defined as deflation in general, my opninion. The 6 cm wasn’t measured on the icesheet but is at bare rock… outside the caldera(s). Rebounce may play a role in the uplift of the area, but isn’t it most of all the pressure what triggers an event? And what is the role of the rifting episode which is taking place? Not much known of that influence. Is the stretching contributing to the pressure building up? Let’s try to put some numbers on. The 5-cm inflation is over a larger area: let’s say 100 by 100 kilometer. That corresponds to a total volume of 0.5 km3. If this is decompression melt (an alternative to rebound), this corresponds to 5km3 of new melt (it expands by 10% during the melting). Bardarbunga lost this much during its eruption; ‘lost’ meaning that it moved north, but it is not clear why the decompression would occur over such a large area. As for new magma, Iceland produces a bit less than 1km3 of mantle upwelling over its entire area. The large majority stays deep down and becomes part of the new crust while the old crust moves away from the rifting zone. Compared to this, I find 0.5km3 of new magma in 6 months just in Vatnajokull a bit too much. Even highly active volcanoes would do no more than 0.01km3 per year. But I am happy to hear counter arguments. My feeling was that pressure imbalance plays a role. As the magma chamber emptied, the rocks below have less weight to carry. The rocks 50 km east/west/south have no change and are under the original pressure. This sets up a horizontal pressure gradient, and you can get some compression inward to Bardarbunga as a result. North of Bardarbunga has more weight to carry (that is where the magma went) so is overpressure and gives a bit higher overpressure. A net inflation in an area around Bardarbunga (but not north) is thus not impossible. The area over which the inflation takes place gives an indication of how deep the source is. The large area means it is deep. The inflation may have different causes in different parts of Vatnajokull, of course. During the winter, snow cover in the Iceland highlands plays a role as that adds quite a bit of weight in various areas. agung steaming heavily this morning, well getting to be evening there! Was just going to ask at 17:43 is that a large plume of steam ? Also 17:46 is that also steam down the left hand side this is where I have seen a line of steam before ? I think the steam, cloud, down the left side can be explained by the cloud/mist creeping up the mountainside. I have watched it many time in that spot Janet, it seems to be a local weather situation that I have seen on many mountains in Scotland also. However when one sees it actually billowing out from the same spot as the crater on the summit one can be 90% sure it is heavy steaming. Did it rain last night at all do you know? Today that steam has been reaching to the top off the picture on the webcam I posted above, I have never personally seen it reach that high before but I don’t watch it every day so could easily have missed it. All we can really say for now is that there is a really hot area in that crater currently! It certainly did seem to be steaming quite heavily, but the weather has been looking pretty awful, so I think it probably has to do with the water in the crater being replenished, falling on hot rock,or running down into the hotter parts of the crater. I’m still on Gili Trawangan, some 60 km away, and I can confirm that it has been raining here last night and also during daytime. It might be different on Bali and around Agung though, but there has definitely been a weather change in the greater area in the last 2 days. Thanks Ash, that would explain the increased steaming then. Looks like there was a deadzone quake early this morning, can’t remember when the last such one was. Are you talking about Iceland Bjarki? Sorry but I am not familiar with where the dead zone is otherwise. I also noticed it. Some uncommon quake patterns on Iceland these last weeks! Yes, i noticed that and was wondering if it may have been picked up because of the new monitors in place for Oreafajokull? As Salting mentions, there have been a few quakes off the beaten tracks recently. Propellors don’t work in a moral vacuum. Progress is made through hot air instead. Out of curiosity does any one have any views on what may be causing the noise with a very the periodic signature on the Agung seismo? It’s undoubtedly man made as it starts at nine, knocks off for a nice long lunch break before finishing around 4.30. I noticed it a few days ago showing above the general daytime noise with a very repetitive period of about a minute. Its there again today until about 10.30 at which point it changes to a much shorter period of less than 10 seconds and then in the afternoon with a period of around 20 seconds. I initially thought maybe buzz saws/tree felling but it’s nature looks way too repetitive for that. raindrops off something parked locally to the seismo? That looks like a pump of some sort. Perhaps a generator? Hmmmm rain and pump combined is a good thought! I considered plant machinery/genny but assumed that would run all day with a very consistent fast tempo. If something needs to be pumped dry to allow work (e.g a mine and it is a tropical rain forest zone after all) then it could vary with the weather. Strangely voyeuristic trying to work out the daily comings and goings from Seismo noise. Would be really helpful to know where it is located, I had assumed it would be half way up the mountain but it looks more like it is sat somewhere on the outskirts of an industrial park. I had read elsewhere that sand is being excavated in the area close to the seismo so a LOT of heavy machinery for sure. It’s a harmonic signal. However, it is not generated by the volcano. It is sourced from a conveyor belt of the sand mining activity. Many thanks Mike. They do like a nice long lunch break at the mine. Most hot places have a long lunch break, necessary to recover from exertions in the heat. Spain usually has 2 hours but there they work later until usually 6:00pm or later. Thanks Mike, I knew I had read it somewhere but age made me forget where. Monika, on facebook, argues that we should place a shield in the L1 point to cool the earth. This idea was used in the novel ‘sunstorm’ by Clarke & Baxter. It is feasible (if you don’t mind a 1000 by 1000 km shield). L1 (1.5 million kilometer from Earth, towards the sun, is a point where an object can keep its place with respect to the earth. but it is not entirely stable and objects will drift away, over about a month, which is less than the billion years that we need. You can stabilise the object by putting it in an orbit that loops around L1, but than it isn’t between us and the sun which defeats the purpose. So some other way to keep the shield in place must be devised. Perhaps not impossible. Plenty of solar energy at L1. If it was light enough a thermal emitter might provide enough force to keep it in place. But then there is the solar wind to counter. Not sure how Helios does it? Some sort of multi-angled “Venetian blind” priciple perhaps, to use the sun’s radiation to move the shield in almost any direction (except the one that matters most I suppose)? For those still trying to keep a track of Agung, it seems like the “Good” cam is now back online. But I am becoming convinced that , for now at least, Agung is returning to a more restful state. The seismograph is looking progressively calmer, and the steam plume only seems significant after rainfall. Well that certainly looks rather strange. But for me, it changes nothing. I think, based on evidence available in the video, we’re just seeing an interaction of cloud and mountain. It seems that there is a bank of cloud approaching from behind and to the left of the peak, travelling towards and to the right of the camera. I think that strange lateral cloud on the right of the peak is just the interaction between the mountain and the main cloud, as it begins to spill over that side of the ridge. I’m sure Agung will erupt, but in it’s own good time. I don’t have the skill to double guess it. I hate to disagree Neil but I do disagree with your conclusions about the steam being cloud. People have been saying for days that Agung is no longer steaming when I have definitely seen it steaming. Put it on full screen and on many days the billowing can be observed. That being said, it doesn’t mean at all that there is likely to be any eruption in the near future. The photos from the crater area are not showing much of an increase in the area of activity. Looking at the last eruption it did exactly what is currently happening. It went quiet for many months then BOOM. I think that it is a very good possibility that a similar scenario will play out this time. Certainly the Seismograph is definitely showing a large drop in quakes and perhaps a lot of what we see are not volcanic quakes either. Also the Indonesian area as a whole has had quite a few moderate tectonic quakes recently, who knows what a large one in the area could trigger. Not me for sure. Hmm, light earthquake Bali region. 4.7 at 10 km deep. Fortunately to small to trigger Agung. And no, I am not a witch, I really didn’t know that was going to happen. And quite a few after quakes now. 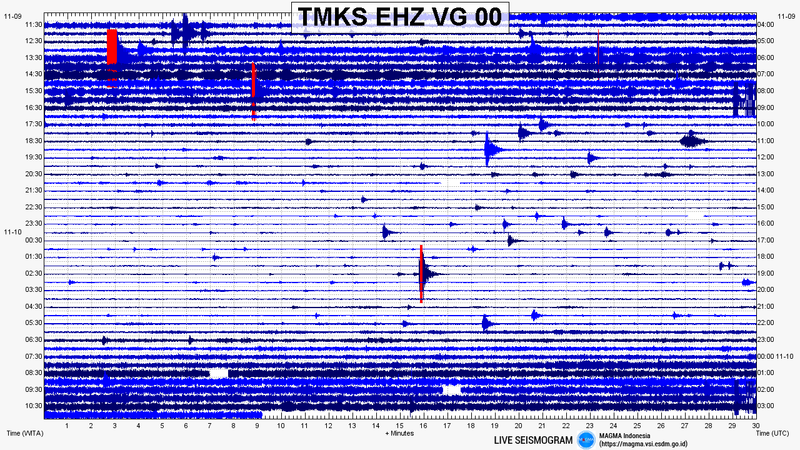 Agung is getting a shaking from this, someone just posted they were woken by the quake. Personally I have not said that the plume is absent. It is clearly more sporadic, and mostly much “thinner” in character than previously, and as I said, much more obvious for a period after the weather has replenished the water in and around the crater. The convection is also more visible around twilight on the night cam than it is on the daytime camera. I don’t find it at all strange that the strange cloud formations/activity happen around the crater. It is, after all, not only the highest point of the mountain, it is also a deep, steep sided hole, and added to that it is hot. All those factors make for unusual effects on the clouds. Some of the things I’ve seen on the cams are consistent with cloud activities I’ve seen in and around one or two steep sided Scottish corries. One that springs to mind is Coire Lagan in the Cuillins of Skye, where I witnessed the wind hitting the top walls of the corrie at just the right angle to set up a circular motion which made the cloud within the corrie become concentrated (and thus more visible) in what might look like a plume if it were a volcanic crater. As soon as that cloud rose above the level of the ridge it was blown flat. It would doubtless help if we were more familiar with the specific geography of the mountain. 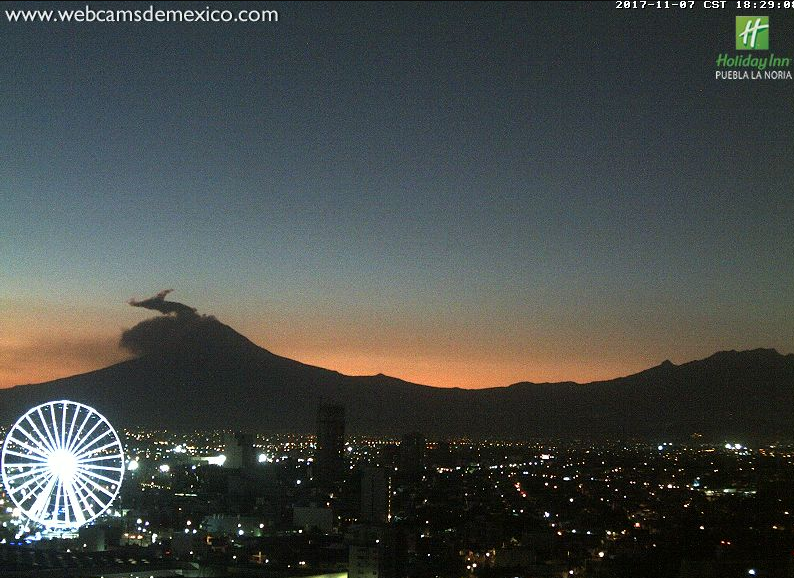 I think this eruption process has stalled. I wouldn’t say that it has permanently stopped. I don’t have that sort of expertise. I also think that the pattern of the previous eruption is still completely plausible. I think that there was a critical moment around 19th, 20th, 21st Oct and something caused the process to back off. At that point, it seemed to me that it was ramping up towards something. Then it stopped. I don’t know why, and therefore I have no reason to assume that it will not erupt either. But I’m looking at the evidence that is available to me. The plume is more sporadic and generally lighter, in general, the seismograph is much quieter, and the Indonesian authorities have reduced the warning level. In the longer term, I think I agree with you. It could very easily erupt, and I worry that it could now do so much more quickly, having received this current intrusion. I agree, Neil. No steam today so far. Yes that plume is definitely coming from the crater area, strange clouds to consistently choose the crater area to form. If they truly were clouds coming up over the mountain then they would also come up over other areas, which indeed they do sometimes, however the true clouds coming over the top of the mountain NEVER reach as a high plume as the steaming does from the crater area. This is from station PLAD on Mauna Loa, where we have seen a couple of sizable tremors in the past week or so. This time, the tremor is lower but there are accompanying frequent EQ’s. This seems to be worth watching. Those don’t look like normal quakes to me… and there’s nothing out of the ordinary on any other drums. We’ve seen genuine tremor-like signals recently and they’ve been visible on instruments al across the volcano; this isn’t. I suspect some local activity – or a problem with that instrument. Activity under Vatnajokul – I guess the area around Bardarbunga is the most likely source (Carl’s unknowabunga is rather quiet out). A minor eruption is not ruled out but not likely. Some deep earthquakes in Iceland today. I would imagine these are magma related quakes. I have a couple if questions if this is okay with your site. 1. Is laki a volcano or a named hill etc and is it active?? . I know it didnt erupt but cant seem to find much on the actual name. 2. If an eruption has happened and released 15km3 of lava. Does that mean a total volume or an area of 15kmx 15km x 15 km?? 2. 15 km3 means 2.5km by 2.5km by 2.5 km, or 3.9km by 3.9km by 1 km, or (more realistic) 40km by 40km by 0.1km, some other combination that multiplies to 15. Well, a LOT of quakes in Agung area now! I really, really hope this is a warning to people there this time! Hmm, they seem to have increased the value of that first quake to 4.9 and VERY close to Agung. Just before the sand diggers start again..It will be interesting to see what happens next! The workers will need the money. I expect they will have lost a lot of income from the closure and have little choice. Poor people! 🙁 🙁 Just looking at the cams and it is hard to see if there is a lot of diffuse steam today or if it is cloud coming over the top. I think cloud is most like as before the Big Bang there was just a few wispy bits of steam and this is far more. Wait and see is the answer as always. And just when I thought the aftershocks were calming down along comes another biggish shock. Looks local again too. Interesting Marek. The first quake was in the sea or close to it, the subsequent ones have moved right to the mountain! Oh Dear! And they are still mining sand close to it! At least it looks like it on the seismogram, that thick wavy line is apparently the conveyor belt. Some aftershock quakes emerged and is seems, that all is going to the calm again. Gah! Seismograph is not responding for me. Looking at the Mountain Observation Post view, I don’t see any steaming. Just clouds lurking with intent to mimic a steam cloud. It appears they are still not sure if quake was connected to volcano or not. Conflicting reports it seems. Unable to find that link unfortunately. And like Clive, I am also unable to access the seismograph. I don’t know…. I have ONE early night and look what happens ! It’s good to get SOME information. All the cams now seem frozen and I still can’t access the seismograph. If this represents a further intrusion (?) with the chamber already charged, then surely that would tip the balance irrevocably ? Like Swebby, the seismograph is not accessible at all from here. But it seems from the statement in your link that the local specialists are trying to establish what the quake signifies. No doubt they will make a further statement when they have some form of conclusion. Just translated Pyters link for anyone like me who need Google translate. Denpasar (Antara Bali) – The Center for Volcanology and Geological Hazard Mitigation (PVMBG) said the magnitude-5 earthquake that rocked Karangasem, Bali, is associated with volcanic activity of Mount Agung. “It means that the episode of Mount Agung has not been completed yet, there is still a lot of energy,” said Head of Mega Monitoring Division of Eastern Volcano PVMBG Devy Kamil Syahbana via an application message in Denpasar on Thursday. According to Devy, the center of the local quake is about 12-13 kilometers from the summit of Mount Agung. Meanwhile, the Center for Disaster Management of Bali Disaster Management Agency (BPBD) Bali stated necessary further study related to earthquake relation with activity of mount as high as 3,142 meter above sea level. Related to the impact of the earthquake, BPBD Bali recorded no reports of damage or casualties after coordinating with all BPBD on the Island of Gods. PVMBG recorded the activity of Gunung Agung from 00.00-06.00 Wita on Thursday (9/11) for shallow volcanic earthquake to reach 10 times, deep volcanic (8), local tectonic (2), distant tectonic (2) and one powerful quake 5 Richter scale with a duration of 198 seconds. PVMBG observed a weak white pressure crater smoke with a thin intensity visible at a height of about 50 meters above the peak crater. Status of Gunung Agung is currently in level III or standby after being lowered from level IV or alert on Sunday (29/10) because one of them is driven by the decreasing earthquake activity. Previously Meteorology Climatology and Geophysics Agency (BMKG) recorded a magnitude quake on the Richter scale rocked Karangasem regency at around 05:54 pm, Thursday (9/11). BMKG noted the quake was centered about 11 kilometers northeast of Kubu precisely, Karangasem regency approximately 10 kilometers with coordinate point 8.26 south latitude and 115.57 east longitude. i’ve not been able to access any of the Magma.vsi links since yesterday afternoon (GMT). At best i get partial loading of the site pages then it hangs. Did anyone manage a screen cap of the quake plots? Whatever the source, a 4.9 very local to the mountain would not be at the top of the wish list of things for those wanting Agung to go back to sleep. Wrt Iceland, again a few EQ’s popping up in places outside of the normally expected zones around Vatnajokull. Many thanks Pyter. a lot of spikes (after shocks?) over the 1hour period post initial big quake. If you’re looking for it on Pyter’s link, it’s a little way down the page…. So , each transient on the line starts pretty much at maximum intensity, which it maintains for a while, before dying off by relatively quick, but not instant degrees. To go back to the comparisons I was offering a week or so back, if this were a sound recording, such transients could be caused by a drummer hitting the edge of a crash cymbal, full force, with the edge of a drumstick , (the classic “Tssshhhhhh” of a cymbal)… but rather than leaving it there, the drummer instantly continues, turning this single stroke into a roll of of rapid and continuous strokes of a similar nature, before stopping, allowing the sound to decay naturally. For anyone not getting the seismogram chart here is a link that works for me. Also not working for me I’m afraid. Why have MAGMA blocked access to all their pages? Have we overloaded them? Being an old fogey I don’t use Twitter or Facebook…. “Being an old fogey…” Don’t sell yourself short. It’s mind over matter. You don’t mind and they don’t matter. Think there may be technical issues. Search google for “indonesian geological web site” and it gives http://www.vsi.esdm.go.id homepage as a hit but with the warning flag “This site may be hacked” message. This does not necessarily mean the site has been hacked, but it indicates that somewhere, something is very unhappy about the sites authenticity and/or security so i am guessing various servers will prevent the site from loading. Clive, did you try the Twitter page? The seismogram is working, cameras seem stuck. Yes, cameras have been frozen since early this morning, actually around 9:00am,ish UK time. No point in looking for any working cams as they all seem to be frozen at source. Don’t understand why as the weather was good at the time. I should correct that actually, I was trying since 9:30am to get the webcams and they appear to have been offline since then. Obviously the actual time they froze is on the cams but not sure if they are local times or UTC. They’re all in local time as far as I’m aware. I don’t use Twitter, it’s all weird. Thanks! Looking at the seismograph now it does seem to me, (no training in anything technical just going by common sense) that the quakes were MOST LIKELY tectonic as it follows the usual course of a large quake followed by smaller, then a not so large quake, followed by smaller still. So in my view a typical signature of a large tectonic quake followed by diminishing aftershocks. Everything now seems to have settled back down to the very small quakes we have been seeing in recent days. So hopefully scare over. I think Magma have cut me off from the Seismo. It must have been all my excited talk about tornillos. Edge, Chrome, Firefox and IE11. On fibre broadband. Nada. Perhaps I’ll fly out to Bali and see for myself – heh heh! More steam than two days ago, when there was steam at dawn. There is indeed. Glad to see the usual cameras back in action! I’m still having difficulty getting the seismograph. The vsi web pages are still unavailable for me as well. Best work around i’ve come up with is this you tube feed – https://www.youtube.com/watch?v=sEf-Asx0-7w It includes the last 2 hours of the plot and if you take into account you can scroll the you tube feed back two hours it means you can see what has happened for the last four. In today’s case, that is not a great deal other than the sand mining shift finishing for the day. I looked at some of the time lapse feeds available on you tube of the summit taken 7-8am this morning (Bali time) and i see what you mean about the steam/vapour plume looking more active than recently. It may be nothing more than a very conducive atmosphere for the plume cloud to form in but it did look to be pulsing and that makes me feel it was indeed more active than it has been for the past week. are countless other “moon related activies” etc… Is there a plan B where our moon can remain as it is? The Moon was plan B.. But the tides may not be as much of problem as you think. Much of the world already has rather little tide. The tides are strong mainly around 50 degrees latitude (that is not accidental: it is where the velocity of the tidal wave in the open ocean is in resonance with the deep water). Local topography can amplify tides but only locally. Surfers will just have to wait for the weather.. As for turtles, I expect that their timing is not driven by the tides (being weak in the tropics anyway) but by the light of the full moon. (Same for famers: the US names its full moons because that is when farmers could work through the evening.) We may need to provide artificial light at night. It so happens that we are rather good at that! Sorry for going off topic but I have a question regarding something I read on an earlier article from February about Iceland that sort of relates to one I made further up the page. My question is if that would amplify the size of an eruption that might take place at either of those volcanoes, as it is possible that small eruptions there are stopped by being quenched by all the water they create. If there is no ice, the eruptions might last longer and become more sustained, sort of like what is happening in hawaii now. I also recall that there are other large volcanoes underneath vatnajokull that are south of grimsvotn ( I think it was called ‘haabunga’ which also possess large magma chambers. if there were uncovered from beneath the ice is it possible for a larger eruption to occur, not necessarily something huge, but something around holuhraun-sized or larger. It wouldn’t be much different everywhere else in Iceland but when the bit still under the ice is also above the hotspot it seems like there would be some significant activity there in the future. Don’t apologize for questions about lava and Iceland, or flying sheep for that matter. It is probably more accurate to describe that as dragging the conversation back on topic. From what I’ve read here, the weight and pressure of the ice cover tends to contain eruptions. The absence of ice should increase the frequency of eruptions. I imagine the volume erupted depends on the volume of magma making its way to the surface and that would depend more on the rate the North American and Eurasian plates are moving apart; which is unlikely to be influenced much by the ice cover. Ash is the physical remnant of something burned by fire. It is my understanding that volcanos don’t really emit ash. Any magma that is not under the ground is lava. If it meets water on the way out, or comes out under great pressure, it may be blasted into small particles of rock that is mistakenly referred to as ash. I stand to be corrected by the experts on all points. About me referring to ‘ash’, I only use that term because it is so widely known, even if it is technically incorrect as rocks dont burn (unless you have some elemental fluorine with you of course). Actually, its been a good while since Carl has appeared here, is he on holiday? He probably would have a really good answer to our questions as he has actually done real life study on the areas in question. An underwater volcano erupts magma (lava) which quickly cools down to rock and during the explosive force of the erupting magma, it (the rock) breaks into many tiny pieces. These pieces are pumice, lava bombs (volcanic rocks thrown away) and plenty of tiny particulate dust, called ash. The more water (or ice) above or within the volcano, the faster the magma cools down into ash. Often the magma is also with lower temperature and great viscosity, and it nearly cools down to a slowly moving thick paste as it reaches the surface (as in Mt St Helens). The pressure from underneath can later make the entire repressed thing blow with greater force later on. Ash is really rock dust, which is frozen (solidified) magma. And you are right in assuming that the quick melting of Iceland´s ice caps will lead to greater eruptions. This happened right after the end of the ice age in Iceland, where the largest volcanic eruptions were recorded in Iceland. Those were far greater then any historical eruption in the past 1000 years. – Great Þjórsá lava eruption, 250km long lava river in Iceland. The current largest visible lava field on Earth! – Trölladyngja, largest and tallest lava shield eruption in Iceland. Like the previous one, also coming from Bardarbunga. – Possible very large lava eruption from Askja. – Vedde ash eruption (possibly largest known Katla eruption) at the late stages of ice age. – Birth of Hekla, sometime in early Holocene. As the ice ages melt at a dramatic pace in the next 150 years, down to nothing (similar rate to end of the ice age), we will probably see a severe increase in the activity of those ice-capped volcanoes, namely Bardarbunga, Katla, Kverfjoll, Oraefajokull, Langjokull, Hofsjokull, Snaefellsjokull, Grimsvotn. It is thought than the pressure decreases, and this leads to larger eruptions. That is plausible. As the weight of the ice disappears, you get rebound and decompression melt. The ice age icecaps were rather thicker than the current icecaps, so the effect may not be as severe, but bigger eruptions than recent ones would not be out of the question. Another shield volcano forming near langjokull would probably be a big boom for tourism as it is close to Reykjavik and could last for years ( and people would probably be pretty interested in a sizeable mountain being younger than them, at least I would :], the last one was in 950 or around then according to GVP). Melting glaciers might also be important concerning the probably future eruption of oraefjokull in coming years/decades. It might be more lava based next time ( or maybe not if it is rhyolite). The Dead Zone, as defined here on VC, is that region between Katla and Bardarbunga that shows a marked lower number of quakes than Icleand as a whole. Since the naming is ours… we sort of control what it means. Looking at the last two times there was a hotspot ‘surge’ like what is believed to be happening now, it looks like there were eruptions of some sort between bardarbunga/grimsvotn and katla, so maybe this cycle will be similar. Im kind of rambling now but its fun to speculate on these events because its plausible and I might actually be alive when it happens. Yes I have all of those articles, they are some of my favorite articles in fact. It is interesting seeing the differing explanations put forward by Albert and Carl. One thing I have noticed about both eldgja and skaftar is that both of them started at their southern ends, before progressing north. In the case of eldgja this was actually away from katla, but skaftar progressed (regressed?) towards the central volcanoes under vatnajokull. To me this actually suggests that the start of skaftar was not directly fed from grimsvotn or thordaryna (is that how its spelled?) but the first part was fed from below, and the extending fissure might have later allowed magma to flow laterally from further north, but not as far or with as much volume. if the magma composition from the start of skaftar is more evolved than that idea is out the window, but I have no idea if a study had confirmed or disproved that as of now. It also occurred to me that while the caldera volume of the central volcanoes seems to correlate with the volume of erupted lava, based on what I remember from the eldgja series, there would surely be a significant amount in the dyke which would leave the caldera volume actually not big enough, the dyke that fed holurhaun was about 1 km3 if I can remember correctly and that was probably much smaller than one needed to fuel a 20 km3 eruption 70 km away. Also if grimsvotns caldera formed in 1783 then logically there was not one before that point, and such there would have been a more prominent mountain in the middle of the glacier, which doesn’t seem to have existed. Prior to Holuhraun, the idea of connected magmatic systems in Iceland was generally looked at with disdain. While the initiation phase is still open for discussion, the fact that one system can feed into another after things get started is mostly proven. I thought it was already known that the 1477 eruption involved magma from both bardarbunga (basalt and mostly lava flows) and torfajokull (rhyolite and mostly explosive)? So holuhraun isnt the first example of an eruption through two volcanoes at once, though it might be significant that both are from bardarbunga. That both erupted is not the main issue. That magma fed from one system to another has generally been disputed. I had even looked for seismic indications that Godabunga had taken part in Eyjafjallajökull but came up short. The thing I was trying to find is if the Katla system had any part of it. Turns out that even Godabunga may be an entity unto itself with a separate feed system from Katla. With as close as those systems are to each other, it would take very little for one of them to get involved in a neighboring event. In 2010 that didn’t happen, but it could have. My main reason for looking at a relationship was due to the statements in the press that Katla always pops when Eyjafjallajökull does it’s thing. That is a full on poor interpretation of the data. Statistically, Katla is always in the process of moving into an eruptive state or has just finished one when Eyjafjallajökull finally gets around to having an eruption. Katla is that prolific. It’s like thinking that the Bus showed up at the bus stop just because you walked out your front door one morning. The bus is gonna stop there whether you come outside or not. Since I finally figured out what this thing you were calling ‘godabunga’ actually was about 2 years ago, I have been curious as to what its eventual first eruption could be like. If it is anything like katla it might still be a way off but the end eruption could be quite big. and given it isnt actually that inaccessible it might be a well documented event. its also pretty close to the ocean as far as icelandic volcanoes go so lava flows might make it there. Of course this is all speculative and maybe none of this will happen at all but its fun thinking about it. With how long this discussion is and the evidence that agung might be on hold for a bit longer, there might even be enough to make a new article about icelandic volcanism :D. I gather they are quite popular on this site. There was an article in the independent newspaper in UK that the scientists think that the west Antarctic ice sheet is melting because there is a mantle plume at work under Marie Byrd land area. I am on a tablet so can’t post the link but I’m sure you will find it if you go for a peep. What would that mean if there is a mantle plume under west Antarctica? From the horses mouth so to speak https://www.nasa.gov/feature/jpl/hot-news-from-the-antarctic-underground . Not sure what impacts it would have but safe to say it would not be helpful for the inhabitants of the Solomon Islands long term. Dawn just breaking at Agung and early signs seem to show steaming again. Wasn’t able to watch what was happening yesterday but will keep an eye on it until bedtime. another hour at least. Steam rising higher than I have seen before but doubt that signifies a lot. Just fumes not steam anymore, any significance in that apart from not been raining much lately? I think what happens is , due to overnight cooling, there’s a little condensation within the crater. Then the heat of the day kicks in and we get an early morning show of steam. Seems to have been a show of steam all the time the clouds have parted enough to see, however apparently it has been raining today and that always ups the steam rate. There do seem to have been many more tremors the last 24 hours, perhaps not surprising with an almost 5 mag EQ cracking off so close to Agung, it must take a while to fully settle down to pre quake levels of seismicity, which were becoming very low. I’m spending less time now watching the cams, but checking in on the seismo more often. I was going to ask if anyone else was thinking the eq’s had picked up? But I haven’t got time to check their locations as I’m usually checking whilst working in my shop. It definitely seems more active. Not crazily so, but there are more “crash cymbal ” transients. Glad not to be on my own on noticing the increase on the small quakes, someone on another site who lives ob Bali said that the paper did mention that there had also been a few harmonic and non-harmonic tremors noticed also yesterday. Still today for them of course. And for those who enjoy watching the steam rising…There’s quite a bit of it rising right now, in it’s now customary early morning …erm…. verticality… or something. The plume is really significant. It may be the biggest and thickest I’ve seen it…Getting some interest from someone at the site of the webcam, which is unusual early in the mornings. 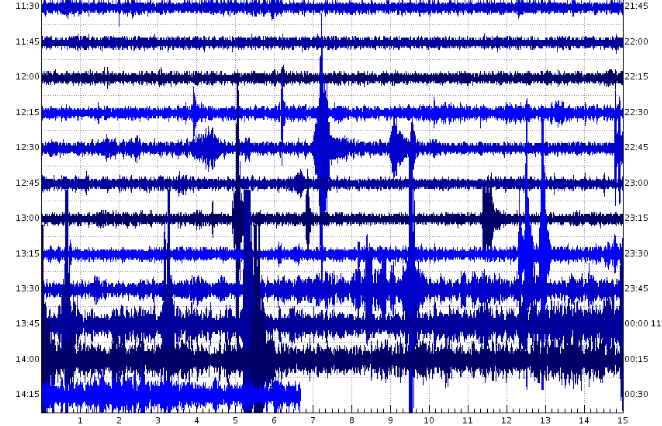 I may be wrong, but the seismograph seems to be on a slow pick up since about 4.45 am local time. The pattern looks different. True to form, the visibility of the plume diminishes as the day gets going. I still think the eq noise is different though. It seems to have started building earlier…about 4.40 am…and more evenly than usual. Wow, looking at the seismograph today it looks like Agung has had a VERY disturbed day so far! Even accounting for human noise something disturbing appears to be at work there. My comment above about seismo, look particularly at 11:08 onwards and 12:00 noon onwards. I’m having difficulty getting the seismograph again. But this was shot at about the same time I was watching the cams last night, and is a fair reflection of what I was seeing, especially around half way through the video. An interesting article here about what the villagers around Agung have been facing, in the camps and out of them. I doubt that Agung is finished with us! But developments have slowed down a lot and the next phase can take years or longer. Worth keeping an eye out. The big quake wasn’t big enough to damage the mountain but was most likely caused by stress on a fault coming from the inflation of the mountain. Just realised the strange and large ‘quakes’ are more than likely blasting the rock for more material for gravel and sand. Rather them than me though, blasting close to a volcano isn’t my idea of an ideal day out! If a relatively large quake can’t kick off an eruption, I won’t worry too much about quarrying…. Unless it were on the edifice itself. Completely off topic but this zoom into a distant galaxy containing a strange supernova is staggering. Fantastic. Light echoes are great fun. 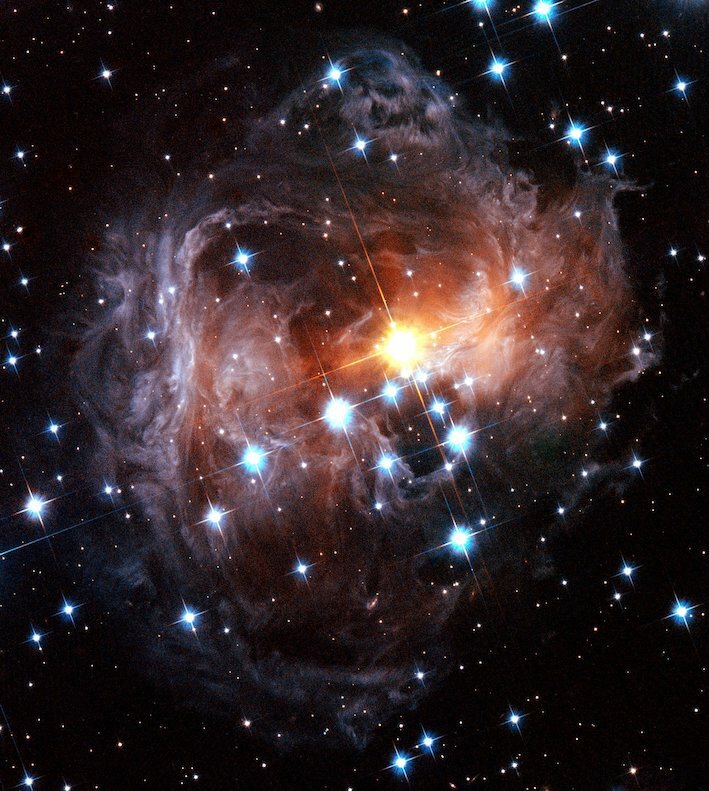 Here is the best of them all, a movie made from a collection of 8 Hubble images, 2002-2006. Do realize that nothing is actually moving. All you see is a wall of light expanding, and illuminating different things. Regarding moving the Earth’s orbit, perhaps Mother Nature will that for us. As the sun expands and goes Red Giant, it’s going to be because it’s lost enough mass (and gravity) to keep the start compacted. The loss in solar mass should (in theory) then allow Earth’s orbit to move outward….perhaps far enough to avoid the “Big Fry”? On the flip side, as the sun’s outer regions approach Earth, the earth should also lose mass as material gets blasted off the planet and into space by the pressure of the solar wind and extreme heating. This expelled gas ejecta will help slow down the earth’s orbital speed, which in turn allow the Earth’s orbit to shrink. All depends which effect becomes dominant. Wake me up in a billion years to check out which effect won out. Not really a mass loss…. the fusion process will peter out and the sun will not be able to maintain the size of it’s envelope due to lower energy output… then the envelope will collapse a bit until the presure grows high enough to start the next stage of fusion. Since it’s energy output will be higher than the previous stage, it will push the envelope out further than the current stage. The way I understand it, this process continues up until iron is the predominant material. At the iron level, fusion does not produce more energy than it consumes, and everything goes to hell in a handbasket. Of course, at all points, the star constantly looses mass due to the solar wind and coronal mass ejections. Caveat: I am not an astrophysicist. But there is one lurking around here that will correct me if I am wrong. Correct. The sun won’t blow up. It will move to the next step in fusion, making carbon of of helium, but no further. The carbon won’t transmute into heavier elements, at least not in the sun. Both of you are right. The sun will grow a lot bigger (covering a third of the sky as seen from earth) and a lot more luminous. The Earth cold reach a temperature of 1000-1500K, enough to melt the surface. Think magma ocean. The Earth will lose the atmosphere and all the water but even these temperatures are not enough to get the vaporised rock to reach space. So the earth will keep its mass (although if you try to sleep through it you may want to consider getting a summer duvet). The sun will lose a lot of its mass: about 47% according to current thinking. So the lesser gravity will indeed cause the Earth to move away from the sun, but not enough to keep the temperatures livable. And it will only happen 5 billion years from now. The alternate option is that the solar winds gets so dense that there is a kind of friction between the Earth and the solar wind (gravitational friction) which slows down the Earth. Once that happens, the Earth would move inward, making the friction worse. That ends with the Earth falling into the sun, giving Craig a rude awakening. The final fate of the Earth is still up in the air. 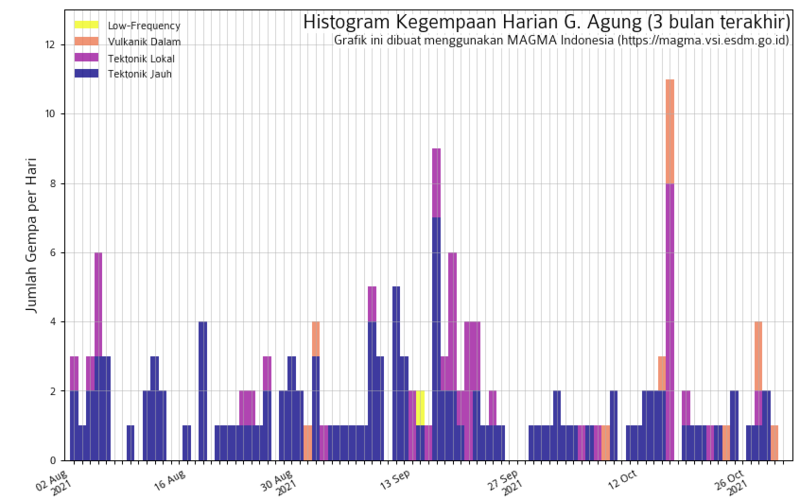 The Agung histogram now has a couple of new legends, one of which is “hembusan” that giggle translate deciphers as “blowing” . Has anyone any ideas as to what this actually refers too? I preferred their old colour scheme for this chart, the new one is difficult to distinguish one colour from the other. Farmeroz & Albert – Excellent Hubble links, many thanks. Mods – sorry, thought i was posting just the link to the graph rather than it showing the latest graph. Please feel free to remove if it is slowing down the page loading. Blowing also means blast. That explains the unusual signature to the ‘quakes’ I was seeing on the seismo chart. Obviously they were blasting areas for the rock to grind down to gravel and sand. A relief there then!